With the LiveChat & Google Plus integration, you can get more followers for your Google+ page by placing a +1 button in the chat window. Anyone satisfied with your service will be able to follow you straight from chat. Google Plus (Google +) is a social networking service provided by Google. The platform allows you to collaborate in Circles - groups of people who share similar interests. Thanks to it, you can personalize your messages and share your content with people interested in it. What's more, if you share a post with a particular group of people, your content won't be seen by their friends and not, as in the case of Facebook. What's more, Google Plus lets you share text messages, photos or links with other users. It also gives you an opportunity to follow your friends and chat with other users. From now on, the +1 button will start showing up in your chat window and your visitors will be able to access to your Google+ page from chat. All that it takes is to provide your Google Plus address and voilà! Sharing the experience about your Customer Service has never been easier. Allowing your customers to go directly to your Google+ page from the chat window, will help you grow your social media presence in no time. This integration will give your website visitors easy access to your Google+ page. Competitive advantage can be obtained by managing your products more effectively and having good relationships with customers. With LiveChat, you can communicate with your customers in a channel they prefer while providing a superior customer experience. 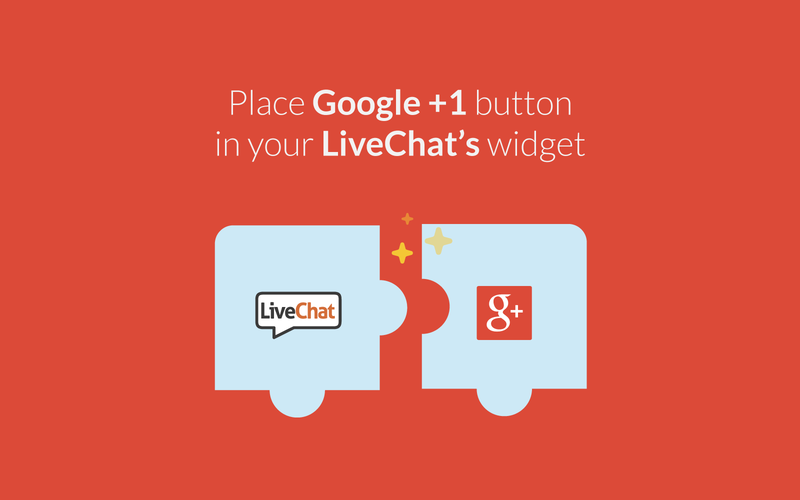 Start using LiveChat with Google+ now!